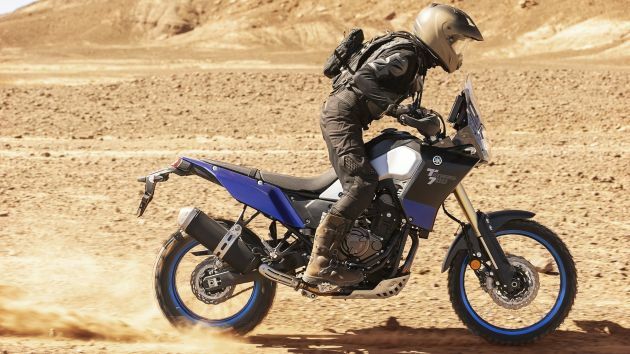 Good news for fans of the 2019 Yamaha Tenere 700 because you can now place an online order for Yamaha’s middleweight adventure tourer for a base price of 9,299 euro (RM42,663). The bad news is this applies to European customers only, with deliveries beginning July 2019. The 9,299 euro price applies for online orders and booking closes 31 July. After that, showroom deliveries of the Tenere 700 begin in September, with pricing at 9,699 euro (RM44,496) for the retail model. Yamaha’s Tenere 700 carries a two-cylinder Crossplane 2 engine, displacing 689 cc taken from the MT-07. Loosely based on a Dakar rally motorcycle, the Tenere 700 mill is good for 72.4 hp at 9,000 rpm and 68 Nm of torque at 6,500 rpm, mated to a six-speed gearbox. Suspension uses 43 mm diameter upside-down forks with 210 mm of travel and 200 mm travel monoshock at the back, which Yamaha says is designed to be capable for control and capability off-road. Weighing in at 205 kg, fuel is carried in a 16-litre tank which gives a claimed 350 km range. Twin 282 mm diameter discs in front and a single 245 mm disc on the rear wheel with switchable ABS handle the braking on the Tenere 700, with a four-element LED headlight giving Yamaha’s adventure bike a distinctive look. There are three colour options for the 2019 Yamaha Tenere 700 – Ceramic Ice, Competition White and Power Black. The post You can buy the 2019 Yamaha Tenere 700 online appeared first on Paul Tan's Automotive News. 0 Response to "You can buy the 2019 Yamaha Tenere 700 online"